EVERY mobile phone needs a SIM card to make a call, send text messages and to perform other communication activities. SIM is the abbreviation of Subscriber Identity Module and a SIM card can be found next to the phone battery inside our phone. SIM card registration is the process of recording and authenticating the mobile phone number and the personal details of a subscriber by the service provider. In 2006, all users of Malaysian prepaid public cellular service are required to register regardless of their nationality. Users should register for every single prepaid mobile number they have with their respective service provider and all registrations should be done personally present at the counter as proxy registration is not allowed. During the registration process, subscribers need to provide mandatory personal information such as name and identity card number. Users need to visit their respective service provider’s service centre, authorised dealers or agents and provide the identity card or passport for verification. Photocopy of identification is not allowed for the verification process. Consumers have the choice to practice safeguarding of their personal information by going to the respective Service Provider website to check on the dealer list to avoid being attended by any unauthorised dealers. According to the Malaysian Communications and Multimedia Commission(MCMC), consumers taking the effort to check for unauthorised dealers can prevent; first curb misuses of the prepaid public cellular services and second, address security concerns. However, when the registration process is done with inacurate or the information given by user is incorrect, it is categorised as False Registration. Fraud registration happens when personal information is used for unauthorised registrations without the knowledge and consent of its’ owner. 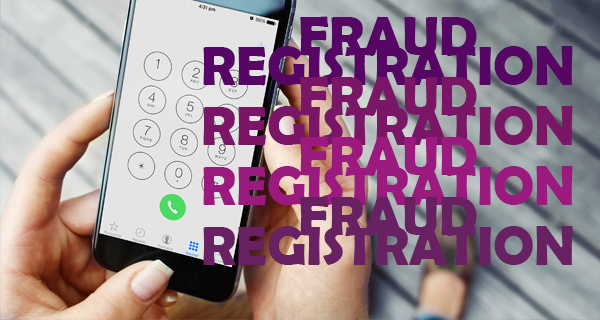 How does fraud registration happen? Fraud registration happens when dealers do not practise good ethics. Misusing existing customers’ personal information to register for a new account without the knowledge of the customer is considered unethical. On top of getting personal information directly from existing customers, the leaks of sensitive information from third party are from various sources. In most cases, victims of fraud registration would discover their personal information was misused after being billed for services they did not subscribe. In fact, fraud registration goes undiscovered until the complaint is lodged. Criminal cases involving prepaid numbers being used for malicious and criminal activities happen more frequently than reported. Hence, we should not neglect the possible significance it would be to our life. Such criminal cases include identity fraud, scams, identity theft, hate message, mobile money fraud and kidnapping. There are some self-regulations in place for service providers to follow in order to curb all possible crime activities. According to the General Consumer Code(GCC) for communications and multimedia industry, “service providers creating, maintaining, using or disseminating individually identifiable information should take reasonable steps to assure that the data is accurate, complete and timely for the purposes for which they are to be used”. Simple put, service providers have to make sure all information obtained from customers upon registration is correct, complete and timely. When a fraud registration occurs, the service provider must carry out an investigation against required documentations which includes police report, actual identity card with original sighted, declaration of oath and frau declaration form. Apart from service providers’ responsibilities, there are some preventive measures that consumers can take to avoid the fraud. Consumers are encouraged to always read the FAQ to have a clearer picture and Terms and Conditions of the contract.